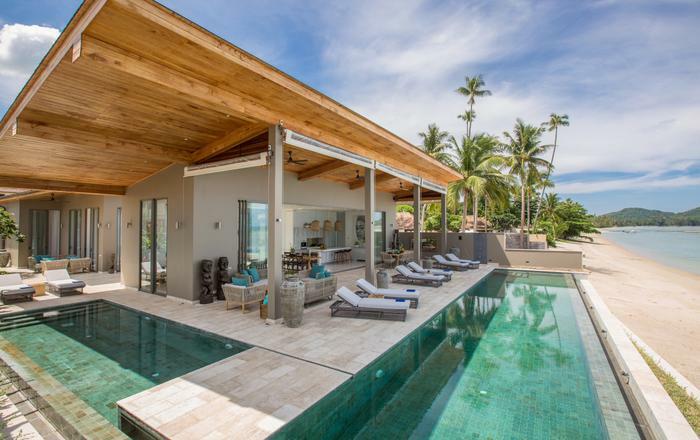 Villa Suma is a contemporary, luxury villa set on Koh Samui’s south eastern coast on the bay of Laem Sor. With its cutting edge design, open plan interiors, high end comfortable furnishings and statement artefacts, Villa Suma is a villa designed for the luxury traveller. The white, clean lines of the villa with its large windows and doors maximise the light and emphasise the already generous indoor spaces and allow the seamless transition between indoor and outdoor living. This 7 bedroom villa provides ample room for a large group of family or friends and the dedicated bunk and play room for the kids ensures all ages in the group are catered for. Its absolute beachfront location provides spectacular views across to the neighbouring island of Koh Tan and the mainland. Built on two levels Suma Villa provides the luxury of space and privacy. On the ground floor are three of the bright, airy en-suite bedrooms that look out onto a landscaped courtyard. Across the courtyard are the open plan living and dining areas. The dining room comfortably seats 12 and the living room is decked out with oversized comfy sofas, elegant décor and a multimedia system for family viewing and entertainment. With views across the infinity pool to the sea beyond, the outdoors is invited in. Up on the second floor are a further three bedrooms, one master, with glorious views over Laem Sor Bay. For snacks during the day or to prepare the kids favourite dishes, Suma Villa custom built, integrated kitchen is furnished with all the necessary cooking essentials and appliances. Realistically though, preparing food could be out of your hands as a private chef is provided during your stay! A daily meeting to discuss the next day’s menu is all that is required of you. From delicious Thai dishes to a seafood BBQ to pastas and salads, the experienced Thai chef will serve up mouth-watering dishes that will satisfy the fussiest of palates. The 12 metre infinity pool, sits directly behind the beach enjoying the cool on shore breezes. A few steps from the pool and you’re on the beach with shallow waters and, at most times, not another soul to interrupt your day. There are kayaks and paddle boards available and jet skis can be arranged for those wishing to explore the coast. Suma Villa’s six en-suite bedrooms are housed in the ground and first floor pavilions, maximising privacy, space and sea views. Three double bedrooms are located on the ground floor and three on the second floor – two of which enjoy sea views. All the bedrooms have king beds, fresh Egyptian cotton bed linen and are bright, airy and spacious. The high ceilings and clean contemporary lines with plush furnishings and modern fixtures and fittings provide a calm and homely sanctuary. On the second floor, a dedicated kids’ bunk room with interconnecting doors to one of the adult bedrooms ensures the children are within easy reach. 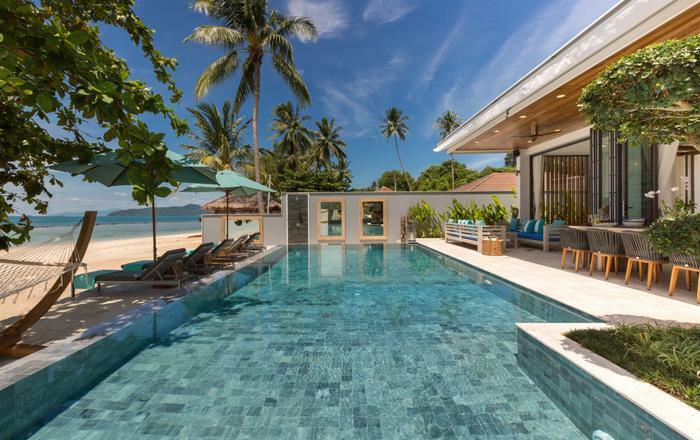 Suma Villa is located on the beach in Laem Sor on the southeast coast of Koh Samui. It is a quiet and secluded area which retains a sense of a time past, mirroring the early days of Koh Samui. Coconut plantations line the quiet roads, Thai villagers are still curious about visitors and greet you with a smile from their traditional teak houses. If you want that desert island feel, then the isolated beaches of the south are close by.